Posts that relate to my scholarly interest in Hindustani Music and South Asia in general. I have wanted to revise and post some excerpts from my master’s research in Hyderabad recently, so here is a part of my research that explores the history of three distinct paramparas of tabla transmission in Hyderabad. There are three distinct paramparas (musical lineages that have more than three generations of transmission) that have roots in Hyderabad because of the Nizam’s love for the instrument. The first stems from Niyamat Khan’s son, Musahib Khan, who left the courts of Indore for the court of the Nizam in Hyderabad around 1920 (the exact date is unknown). Although he did not stay for long, three of his disciples (the first two of which were his own sons) Ustad Bahadar Khan, Ustad Karmu Khan, and Ustad Maulla Baksh, stayed in Hyderabad and under the Nizam’s patronage for their entire career. Aban Mistry suggests that “after circa 1926 A.D., . . . the new Maharaja [of Indore] was fond of music but severely lacked his father’s extraordinary flair for music . . . So during his reign, many artists left Indore and went away. As per popular belief, most of Indore’s artistes settled down south in the courts of Hyderabad” (Mistry 1999:286). Consequently, Musahib Khan’s parampara in Hyderabad represents the Indore connections to Hyderabad. The second parampara emerges from Ustad Munir Khan, who learned from the son of Ustad Haaji Vilayat Ali (the founder of the Faroukabad gharana), Hussain Ali Khan. Although he was not born in Hyderabad, he settled there early in his life because his father, Karim Baksh, who was not a tabla player, found work and moved to the budding metropolis. As a result, Ustad Munir Khan lived and taught in Hyderabad most of his life but eventually settled in Bombay. Some of his most famous students who did not live in Hyderabad, Ustad Amir Hussain Khan of Bombay and Ustad Jan Thirakwa Khan, continued to visit and learn from him while leaving their mark and traces in the Hyderabad tabla community to the present day. The third parampara in Hyderabad includes Ustad Shaik Dawood Khan but stems from the son-in-law (Ustad Hussain Baksh) of the founder of Faroukabad gharana. 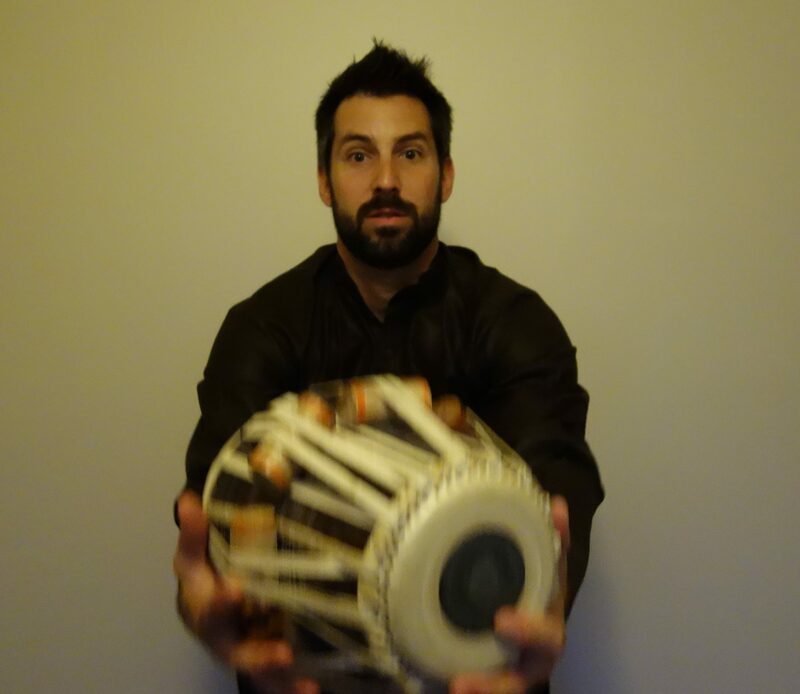 It is important to note here that both the son and the son-in-law of Ustad Haaji Vilayat Khan are represented as two distinct paramparas of tabla in Hyderabad (they continue to be quite divided today). Ustad Hussain Baksh was loved by the Nizam so much so that it was said that he “would place himself next to his [the Nizam’s] royal seat and play the whole night through, while the Nizam languishing in the soothing effect of his Vaadan would doze off intermittently” (Mistry 297). Ustad Alladiya Khan, the son-in-law and senior disciple of Ustad Hussain Baksh, also earned his seat as a member of Nizam’s court musicians as well as his two sons, Ustad Mohammed Khan and Ustad Chote Khan. Amod Dandage (Farukhabad Gharana) playing here Peshkar in Teentaal. Amod Dandage is a disciple of Us. Mamhulal Sangaokar, Pt. Omkar Gulwadi & he has been training under the able guidance of Pt. Arvind Mulgaonkar for the last 15 years. To add to Courtney’s description, there are a number of different approaches to peshkar stemming from one’s gharana. For example, Faroukhabad’s peshkar always expands from a set pattern of bols (tabla sounds) that is distinct from say, the Panjab gharana. All gharanas too, have their own aesthetic approach to expansions and variation. Furthermore, within this aesthetic there are individual nuances and additions that give peshkar its amazing depth and scope. Within the Benares gharana however, the popular composition known as ‘Benares peshkar’ is treated more like a kaida. A quick note: There are no citations here because this is only a quick reflection on an article that intrigued me. This is not meant to be a scholarly paper. In Stephen Slawek’s article, “Engrossed Minds, Embodied Moods and Liberated Spirits in Two Musical Traditions of India.” he attempts to explain a few ideas regarding Indian classical music: (1) he demonstrates the absence or avoidance of “spirituality” in scholarly engaged articulations on Indian music, (2) he discusses how seemingly disparate modes of Indian music making (i.e., classical and folk), are in fact much more connected than previous scholarly writings have presented them before, and (3) he concludes through a comparison and analysis of Abhinavagupta’s 11th century rasa theory to anthropology theorists Pierre Bourdieu, Robert Csordas, and Marurice Merleau-Ponty, by asserting that indigenous versions of cultural theory will provide, especially in the case of Indian music, a more illuminating and gratifying conclusion of why things are the way things are. From reading this article I had the feeling he is not satisfied with the way that ethnomusicology has engaged with local theories of cultural development. Granted, this article was written 14 years ago (1995), and I do not know what the significance of this article actually was on scholarly engagement of indigenous theory, but I do know that many ethnomusicologists today constantly engage in what is known as local theory, which, is exactly what he claims has been overlooked by many within western Indian musicological engagements. Slawek posits that the reason behind this is because many scholars felt the need to distance themselves from ideas that emerged from Indian music in the 60s–ideas that spawned cliches about Indian music providing spiritual enlightenment (and ultimately culminating in new age movements that are so popular today). To this, I agree with him, but I also feel that he left out a very obvious reason why so many have not concentrated on the spirituality behind ICM (Indian classical music). Throughout recent histories of India and Indian music scholars have pointed out the need to include Muslim heavy narratives of Indian music because of previous Hindu dominated trajectories of history. Consequently, many ethnomusicological studies on ICM came out of this awareness and proceeded to tell the stories of the Muslim lineages of ICM and how they related to ideas of Hindu nationalism. In this light, I disagree with Slawek in his assessment of why scholars have avoided discussion of spirituality, although I certainly agree with him that they have. Slawek’s second main point in this article illustrates how ideas of ICM and Indian devotional folk music are much more connected through strains of spirituality than previously portrayed. What struck me, was again, his lack of a Muslim voice in his arguments. From north India, ICM, has been apart of Muslim traditions and practices for centuries, and for most of the gharana instrumentalists alive today, their forefathers were raised among courtly entertainers who had little or no business in the kinds of “spiritual” affairs Slawek discusses. I do not mean to bash or discount Slawek’s conclusions here, rather, I mean for this to be a discussion of how complex ideas of India’s history (or perhaps any one’s history) really are. Through this article Slawek insinuates that there is only one trajectory of Indian history, which, in my opinion, is an extreme oversimplification. In the conclusion of this article–its strong point–Slawek successfully demonstrates the ways that Abhinavagupta’s theoretical treatise on rasaactually provide more of an illuminating conclusion than leading anthropologist’s theories do. But what this conclusion lacks, is a further discussion of the politics of his own choice to focus on a Hindu treatise for a musical tradition that has been essentially dominated (except for the past 150 years) by Muslims. Leaving for India in a few days, this passage sparked an interest. What is globalization? I know many people have written about this, but to me, concrete definitions are still a bit elusive. I like this description because it starts with a critique of capitalism in America. Do corporations that are spawned by Untied States capitalism really have no obligations to the people of the nations that they seek to expand in? The obligations that I think they (corporations and the wealthy) are most interested in are concerns that create and promote consumerism whereby obligations rest in a creation and maintenance of happy consumers. In the light of McChesney’s assertions, then, globalization in the widest sense is an attack on the way of life of myriad non-consumer societies that still exist today. Just coming back from SEM, the Society of Ethnomusicology and completely energized to do my projects. I was blessed to meet my favorite scholars and they were more than I expected, especially Regula Qureshi (University of Alberta), Allyn Miner (U Penn), and Dan Neuman (UCLA). I can’t wait to practice again and to get started on my new material… More later. Why does the west insist upon creating a world of yoga arts that is so different from the Indian expressions it claims to come from? If there are already Indian communities in diasporas, and temples associated with them in almost every major city in the western world, why is it that western practitioners do not turn to those centers for kirtan and other such spiritual practices? It is, as so many are claiming, a form that comes from Indian roots, and if the roots are there, why not go to them? These are difficult questions to answer but I want to begin by our incessant need in the west to commodify. Because everything in the west has been framed under the capitalist condition, value rests on the sole feat of commodification. The entrepreneur is glorified in the west, and the new is sacred, but to sell that “new” is the ultimate state of achievement. We cannot seem to escape this condition. Yoga simply fits into this equation just as any other new product, and because Indian temples in the U.S. do not offer this commodification, the west has to create their own world to fit their needs of a specific market. Without this in place, yoga and the arts associated with it would have no value. There are other ways to answer these questions and each gives us different insights into the psychology of the yoga economy. There is an addiction in the west to the simulacrum (the definition of simulacra according to Baudrillard is a representation of something that has no original, or a copy of something that does not exist) which, in regards to the yoga community is a condition that the yoga teacher and the kirtan singer stem from; it is a condition not unlike the epidemic of reality T.V. The simulacrum of reality T.V. pervades the audience in all directions, because the representation of the real is not truly the real, as it was not constructed from any place of true representation. It was rather, constructed by the producers and investors from a place of marketing, to look real; it is then transformed into the “hyperreal.” The reality T.V. show is sold as something that is, “More real than the real, [and] that is how the real is abolished” (Baudrillard 81). Hence, the hyperreal. What I am saying here is that we are addicted to the hyperreality that creates the simulacrum in the came way that we are addicted to the necessity to commodify. The yoga world (or economy) has neatly fit all elements involved in their bhakti driven market economy into these addictions. The yoga teacher and the kirtan singer are hyperrealities of something that has no original. How can the products of yoga being born out an entirely new system of thought be a representation of something other than that system of thought? That system of thought, as I have explained throughout this paper is, the system of commodity and simulacra, where fetishes, like that of music, are born out of this system. The system has imploded on itself, where it does not even have the ability to recognize itself as distinct from the original, that is the system of thought that bhakti originally sprang forth from in India. “Strictly, this is what implosion signifies. The absorption of one pole into the other, the short-circuiting between poles of every differential system of meaning, the erasure of distinct terms and oppositions, including that of the medium and of the real–thus the impossibility of any mediation, of any dialectical intervention between the two or from one another” (Baudrialld 83). These poles can be described as two systems of thought, one side being the original system that gave birth to the bhakti movement, and the other side being the system that has now taken a hold of the bhakti movement. This new system transformed the meaning of bhakti by its very roots, and consequently imploded the whole system into itself because of the marketing. Bi-products of this system are the simulacrum in all corners of the yoga world.